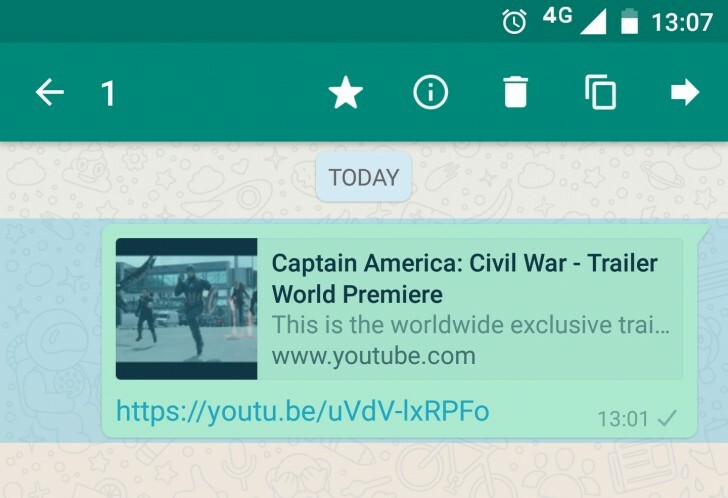 WhatsApp for Android has been updated with a few handy new features, couple of which had been introduced on iOS a few weeks back. The first is the ability to star messages. You can now press and hold on a message and get the option to star it. This works like bookmarking, where you can star messages to go back to them later in a separate folder. The other new feature is rich link previews. No longer will you see just the URL or a small thumbnail when you or someone else shares a link. The app will generate a small preview with the article title and a larger thumbnail. You can choose not to show the preview while sharing links. The last new feature is exclusive to Android, or more specifically to Marshmallow, where you can now get access to Android DirectShare, allowing you to share directly to specific contacts or groups on WhatsApp within the share sheet itself. The update is now live on the Play Store.